Exams dates for 2019 have been revealed. The official dates of this year’s school exams have been set by the government. The brevet des collèges (taken usually at age 15) will take place on June 27 and June 28. The BAC (baccalauréat), which is divided in two years, will start on June 17. For pupils in première, it will take place on June 17 and June 19. For terminale (last year) students, it will take place all week, from June 17 - June 24. Secondary pupils will also have to go through oral exams which start the last week of June. 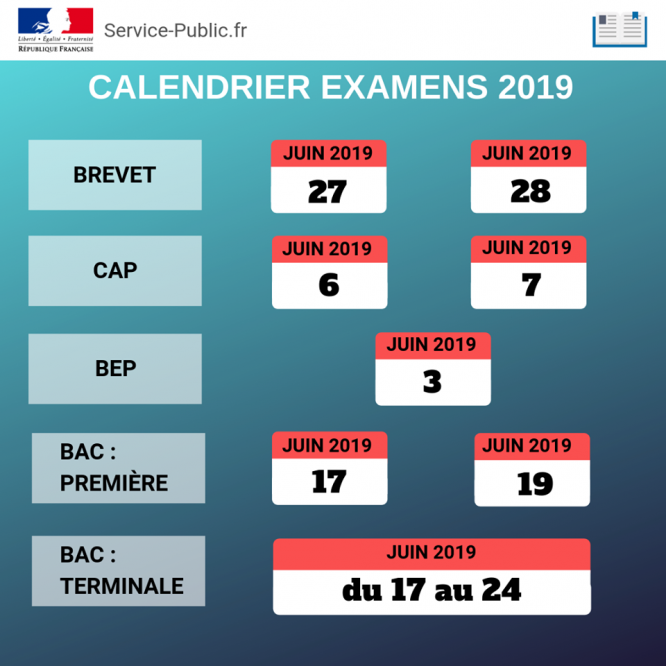 The BEP (brevet d’études professionnelles) will take place on June 3 and the CAP (certificat d’aptitude professionnelle) will be on June 6 and 7. These two diplomas are professional (they can offer a diploma in the same fields: sales, electricity, beauty…) but the CAP is shorter and allows young people to work directly after passing the exam. Results for the BAC will be given on July 5.